I started Larimeloom in 2007, I was right out of high school, trying to find my place in the world. I had my mother’s old Singer sewing machine, a stash of bits and pieces of cloth, and a knack for doing things with my hands. So I started sewing, designing directly with the fabric, cutting and shaping it as I went along. The thrill of the fabric flowing under my fingers and magically transforming into a useful, wearable and pretty object was addicting, and those first few years I would sew and sew for hours and hours, falling in love with each new design as it came along. The sheer quantity of hours spent sewing, and the number of garments I created helped me to quickly grow my skills and the quality, complexity and strength of the designs I was producing. Over these years my passion for my craft has only grown and deepened, and the infinite possibilities both on the artistic side and in the handiwork itself keep me inspired every day. I love making things with my hands, and I enjoy the idea that some one out there will enjoy what I made. I like the feeling of accomplishment that follows the completion of an entirely new, unique project, the creation of something from scratch, that will live it’s own life, will be lived in, will be appreciated. Larimeloom is a small company, each fase of the process is curated individually, with attention to detail. We build our product around the person, gradually growing and deepening our artistic capacities and our understanding of the human body, it’s needs and it’s beauty. Nothing feels and looks better on the body then natural materials. Also, to me, nothing is more thrilling to work with. This is why I select only the highest quality fabrics, made of natural fibers such as silk, wool, linen and cotton. Many of my wedding dresses I hand dye myself, using plant dyes (purple cabbage for a prudery blue, tea leaves for the loveliest ivory there is, onion peels or golden rod for a vibrant golden yellow, chestnuts for a warm brown, black-eyed-susans for a warm muted green, poppy petals for a dusty lavender) or non toxic acid dyes, in order to achieve the softly muted colors I so love to incorporate in my designs. The misty cloudy hues are mesmerizing. The light, flowing, breathable fabrics are enchanting. Each garment that leaves my studio is individually made by the hands of a person through every single step of the process..
From the design and pattern, draped and drafted by me and altered to suit each client’s proportions, through the cutting, and the careful stitching and finishing. Because each piece is made one at a time, there is lots of room for customization, and incorporating personal touches in a design fits fluidly in the process. 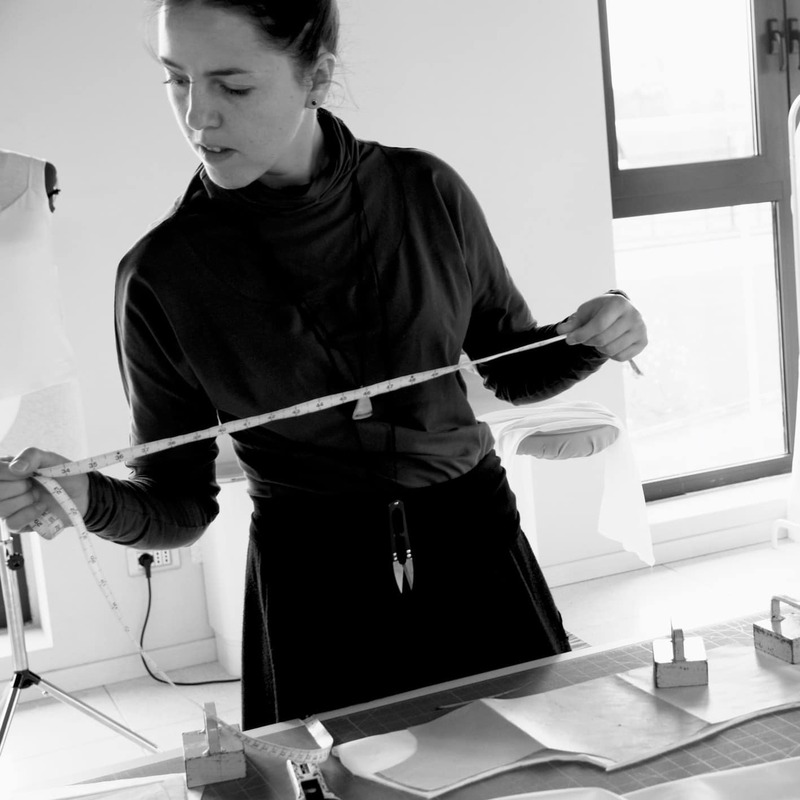 A handmade garment has a character no factory-sewn, mass produced item can have. It’s small irregularities, small careful stitches, the unique and slightly varying cut of every single one ensures an individuality and personality that reflects that of the maker, and that of the wearer. Of American mother and Italian father, I have lived most of my life in Italy, and here I have started and grown my business. Both my parents are strongly artistic, raising me and my six younger siblings to a hands-on approach to life. From gardening to woodworking, music making, weaving, spinning, cooking, drawing, knitting, reading, sewing, traveling, our days were alway full, and our minds were forever shaped around the thrill of making things. Italy has a strong tradition of handcrafting skills, associated with high quality and rich artistic value. I am proud to be able to blend the new and the old, my family values and my own passions within what I do and what I bring to the world.